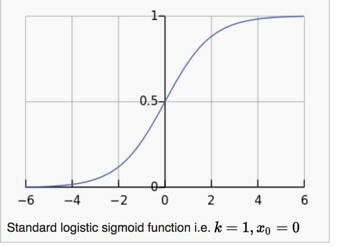 The graph above shows a logistic function that maps out a sigmoid curve… otherwise known as an S-curve. This function was popularized by mid-19th century scientist Pierre Francois Verhulst who applied it in his study of population growth. Verhulst found that population growth follows a certain S-curve. It grows at a steady state until it hits a certain point where it grows exponentially. This exponential growth sustains until the system hits a saturation point where it slows and eventually stops. The S-curve is one of those strange universal laws that shows up all over the place. Similar to how power laws, as put forth by Pareto, dominate nature and the law of entropy permeates the universe, so to does the S-curve show up time after time in natural systems. The S-curve has been successfully used in projecting growth in new technology adoption (we used it to analyze Apple’s business and iphone adoption rates), to biological systems, nonlinear geoscience relationships, economics, demography and the list goes on. You’re probably wondering why I’m talking about some 19th century Belgian scientist, logistic functions, S-curves… and all this jazz. The S-curve lies at the foundation of what I think will be one of the largest global macro forces driving markets over the next decade. We’re about to begin seeing its effects very soon. Put simply, THIS WILL BE BIG. French philosopher Auguste Comte, rightly said that “demography is destiny”. He was referring to national power. But, if you take demography and combine it with rising wealth, then you have economic and market destiny as well. The more wealth people have, the more nonessential goods people buy, and the more commodities they consume. There’s a very interesting and well documented relationship between rising GDP (as noted by GDP per capita) and commodity intensive consumption. In other words, once a country hits a certain level of GDP per capita (ie, wealth) they begin to consume a lot more oil, gas, wheat, copper, livestock etc… This consumption grows exponentially. Can you guess what type of shape this gdp/commodity consumption relationship takes? 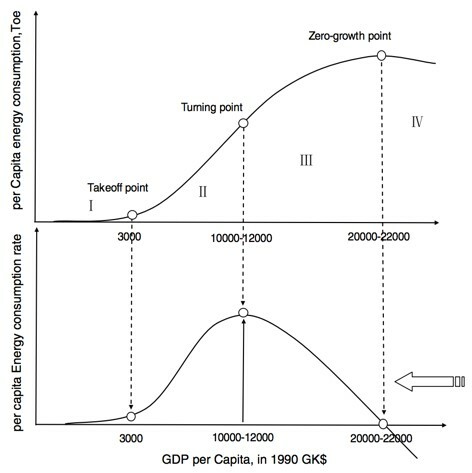 The chart below shows the S-curve (on top) and per capita energy consumption on the bottom. When a country’s GDP per capita hits the ‘Tipping point’, energy consumption begins to rise at an exponential rate. The same S-curve dynamics occur in agricultural consumption too. Once a country passes the GDP per capita tipping point, they begin to eat significantly more protein. Raising livestock is over seven times more grain-intensive than producing for a simple plant based diet. The resulting impact on the agriculture sector is significant. Keeping track of where the world’s population sits on the GDP per capita S-curve, or let’s call it the wealth S-curve, is important. If a large portion of the global population is transitioning from the turning point to the zero-growth point (refer to the chart above), or tipping point to turning point, it would have far reaching impacts on not just commodities but global markets as a whole. For example, one of the largest drivers of the last secular commodity bull market which started in the early 2000s and ended in 2011 was the rise of China. 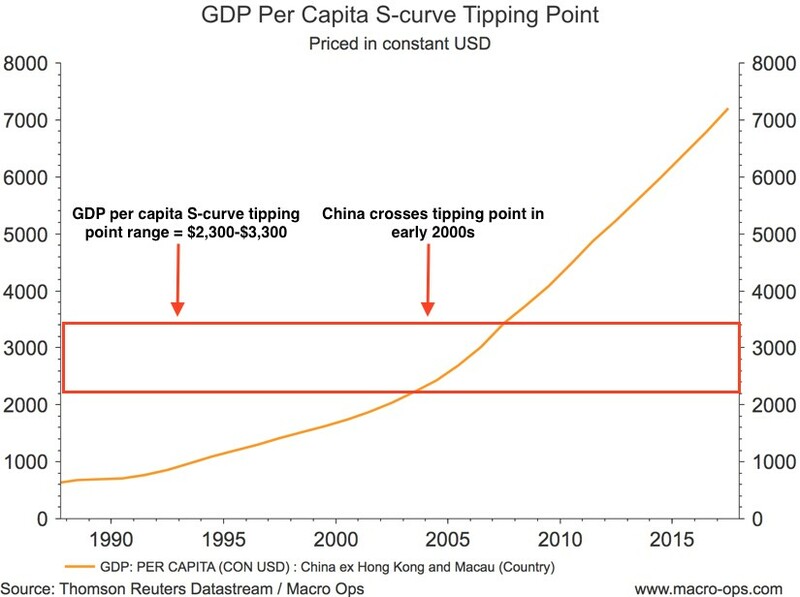 China, the most populous country in the world with 1.4 billion people, crossed the tipping point of the wealth S-curve in around the early 2000s. From our global macro research we know the tipping point on the wealth S-curve that signals more intensive commodity consumption is in the range of $2,300 to $3,300. Once a country crosses this point its commodity consumption begins to rise exponentially over the following decades. The average Chinese citizen in 2001 consumed 1.4 barrels of oil over the course of the full year. Total vehicle sales in 2001 averaged 2.2 vehicles per thousand Chinese citizens, while the airlines carried approximately 57 out of every thousand Chinese citizens. In many respects, 2001 was a typical year for Chinese per capita oil demand growth: it grew by 0.02 barrels per person that year, very much in line with the average rate it had grown over the prior 25 years of 0.03 barrels per person per year. But shortly after it hit its “tipping point” in the S-curve…. The average Chinese citizen consumed 2.2 barrels of oil over the course of the year. Instead of two vehicles being sold per thousand citizens, by 2008 this figure reached nearly nine vehicles. Similarly, total passengers carried by airlines increased from 57 per 1,000 Chinese citizens to nearly 100. Before most analysts realized what had happened, Chinese oil demand growth had quadrupled from 0.03 barrels per person per year to 0.12 barrels per person per year in only seven years. We can see the S-curve dynamic play out on the chart below. 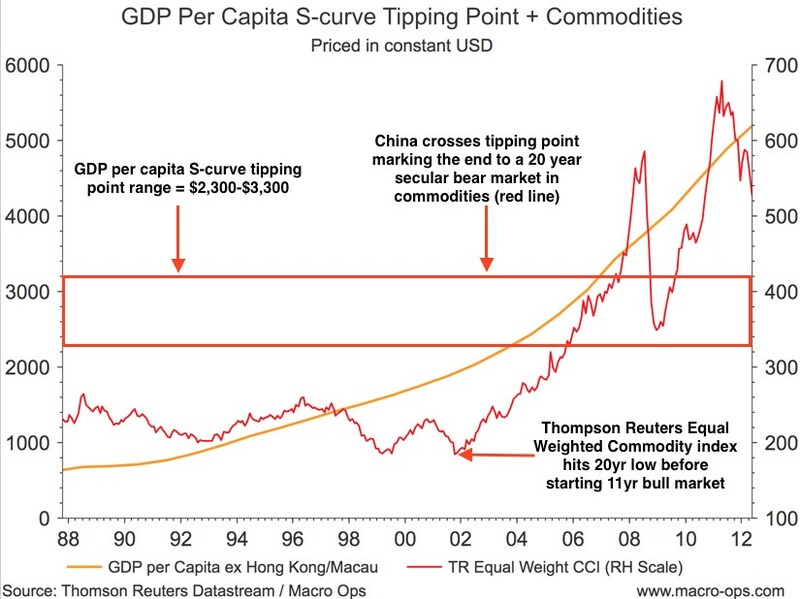 A 20-year bear market in the Thomson Reuters equal weighted commodity index bottomed in 02’ and began a 11 year secular bull market right as China and its billion plus people crossed the tipping point. If you bought the commodity index in 2000, right as the tech bubble was bursting, you would have compounded your money at over 20% annually over the following decade. Wealth + demographics = market and economic destiny. Now that you know the massive impact shifting populations along this curve can have on global markets, here are some excerpts from a recent — and widely unnoticed — research paper put out by the Brookings Institute. It’s titled The Unprecedented Expansion of the Global Middle Class (emphasis mine). There were about 3.2 billion people in the middle class at the end of 2016. This implies that in two to three years there might be a tipping point where a majority of the world’s population, for the first time ever, will live in middle-class or rich households. The rate of increase of the middle class, in absolute numbers, is approaching its all-time peak. Already, about 140 million are joining the middle class annually and this number could rise to 170 million in five years’ time. An overwhelming majority of new entrants into the middle class—by my calculations 88 percent of the next billion—will live in Asia. The implications are stark. By 2022, the middle class could be consuming about $10 trillion more than in 2016; $8 trillion of this incremental spending will be in Asia. 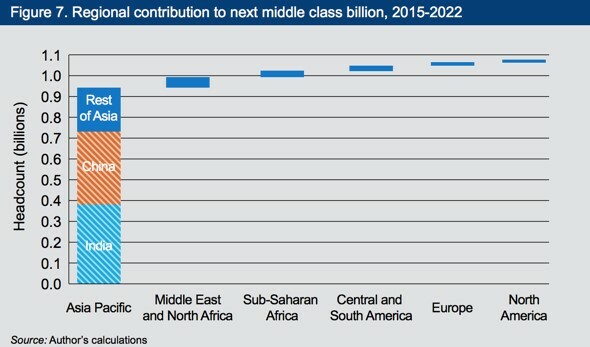 By 2030, global middle-class consumption could be $29 trillion more than in 2015 . Only $1 trillion of that will come from more spending in advanced economies. Today’s lower middle-income countries, including India, Indonesia, and Vietnam, will have middle-class markets that are $15 trillion bigger than today. We are witnessing the most rapid expansion of the middle class, at a global level, that the world has ever seen. And, as Figure 7 makes clear, the vast majority— almost 90 percent—of the next billion entrants into the global middle class will be in Asia: 380 million Indians, 350 million Chinese, and 210 million other Asians. The new S-curve driver of this commodity intensive growth trend is going to be India. India is nearing the tipping point on the wealth S-curve. It’s GDP per capita is exactly where China’s was in 2001, right before the last commodity bull market began. India has a population of over 1.3 billion people. Just 60 million shy of China’s. GRA also shared the following in its quarterly letter (emphasis mine). From 1970 to 2000, the average number of people going through the S-Curve tipping point globally was relatively stable at approximately 700 million. If we are correct, then we are on the verge of having four billion people globally all going through the S-Curve tipping point together. Simply put, we are potentially entering the largest period of commodity demand growth the global economy has ever experienced. And as we’re about to enter the largest period of commodity demand growth the global economy has ever experienced, how exactly are commodities fairing? Commodities have only been priced this low, relative to financial assets (as represented by the Dow), two other times in the last 100 years. The market is clearly not seeing the forest from the trees in the commodity market and it’s about to be caught offsides. And remember our discussion from last month’s Macro Intelligence Report (MIR) about how we’re in the third phase of the Investment Clock cycle, otherwise known as the overheat phase, where commodities are the best performing asset? Here’s a quick refresher from that report. Phase 3 – Overheat phase: Productivity growth slows and the GDP gap closes causing the economy to bump up against supply constraints. This causes inflation to rise. Rising inflation spurs the central bank to hikes rates. As a result, the yield curve begins flattening. With high growth and high inflation stocks still perform but not as well as in phase 2. Volatility returns as bond yields rise and stocks compete with higher yields for capital flows. 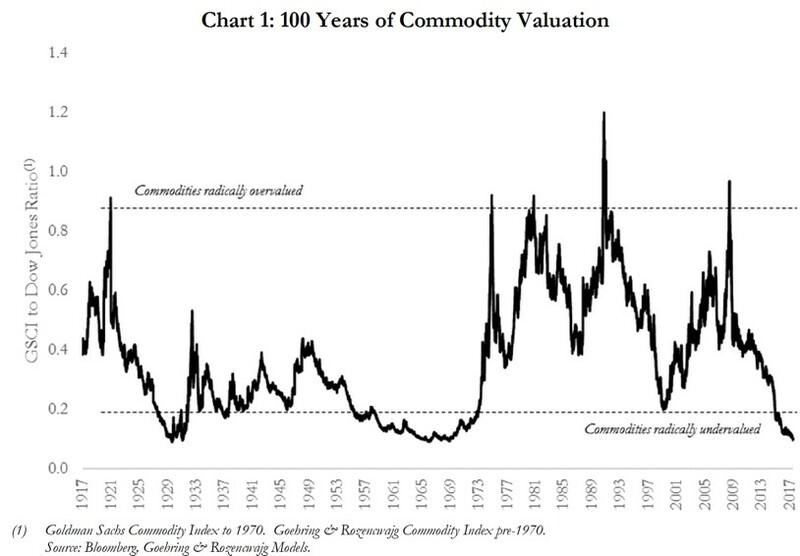 In this phase, commodities are the best asset class and cyclical value the best equity sector. We have MASSIVE secular tailwinds lining up with third phase drivers plus commodities at 100-year lows relative to the stock market. Not surprising given the horrid price action in commodities over the last five years. 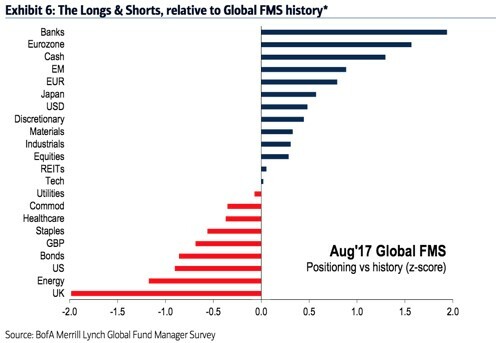 The BofA fund manager survey has hedge funds holding very low levels of commodities relative to historical positioning. 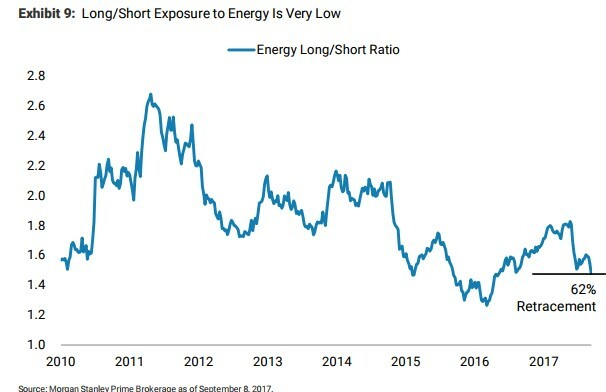 Morgan Stanley recently shared that the long/short equity managers they broker for have rarely had lower exposure to energy stocks than they do now. And the ratio of longs to shorts is in the bottom decile of the past seven years! As a contrarian, I love situations like this. Finding and executing great trades is about peeling back the curtains of time and peering into the future and putting the pieces of the puzzle together better and faster than the market. This is one of those times, where the market’s narrative has been carried to an extreme and is based off a past that’s no longer relevant and differs completely from the coming future. Well, right now, I see a big pile of commodity backed money lying over in the corner. And all we have to do is start picking it up! We did this last month, by initiating our long position with an energy basket. In that report we recommended RIG, CRR, and COG. We bought those and also threw in WTI and ESV which our Collective members were notified of. The basket is off to a good start. Since the MIR’s publication RIG’s up 27%, CRR +18%, COG +0.5%, ESV +30%, and WTI +57% (climbing as high as 90% at one point). We believe, for the reasons stated above, that this is just the start of the run in the commodity market. We expect a lot of up and down action in our holdings. This is usual at the start of a new bull market. But we’ll hold through the volatility, while respecting our risk points of course. And we’ll look to build on our energy plays as well as other commodities we’re stalking and which I will talk to you about next. The S-curve lies at the foundation of one of the largest macroeconomic forces driving markets over the next decade. 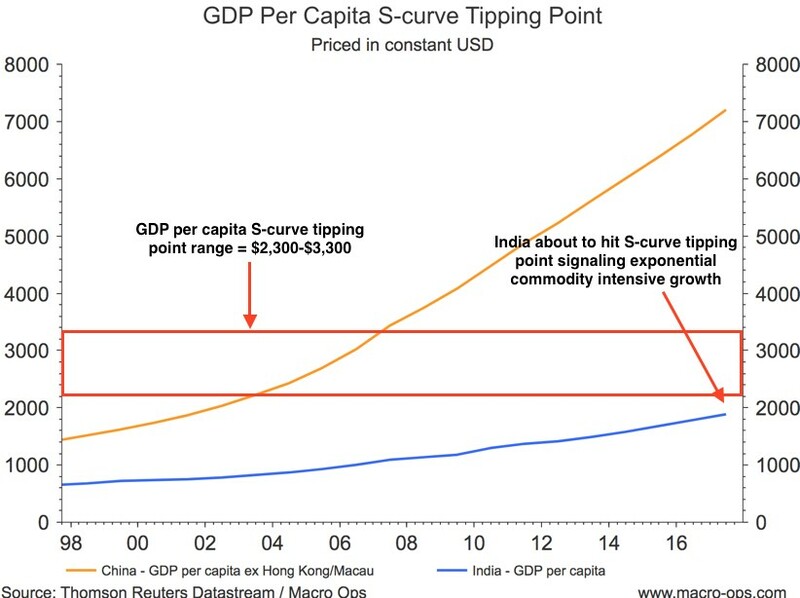 When a country’s GDP per capita hits the ‘Tipping point’ on the S-curve, commodity consumption begins to rise at an exponential rate. We have MASSIVE secular tailwinds lining up with third phase drivers (Investment Clock) plus commodities at 100-year lows relative to the stock market. This will propel a commodity bull market forward. If you’re interested in learning more about the Macro Intelligence Report (MIR), click here.